A simple way to realize a reflecting device (a mirror) in fiber optics is to make a fiber loop, using a two-by-two directional fiber coupler where the ports on one side are connected to each other with a piece of fiber (see Figure 1). Figure 1: A simple fiber loop mirror. If one feeds light into one input port (e.g., the upper one in Figure 1), the power is split so that two counterpropagating waves are formed in the loop. When these waves then again come together at the coupler, they interfere with each other. This interference determines the optical power sent back into the input port as well as the power leaving the other port. The interference conditions can in general be influenced by various aspects that as multimode behavior, polarization changes and nonlinear effects. The fiber loop mirror can also be considered as a Sagnac interferometer. In the simplest case, one uses only single-mode fibers, and the polarization state remains unchanged during propagation. (One may use polarization-maintaining fiber or alternatively a fiber polarization controller to obtain that situation even when using a long loop.) Also, we assume that the optical powers are so low that nonlinear effects (particularly the Kerr effect) are negligibly weak. Further, we assume that no power losses occur in the fibers, and that the fiber coupler has 50:50 power splitting ratio (i.e., it is a 3-dB coupler). In this simple case, the interference conditions are such that all injected power goes back to the port into which it was injected. This means that the fiber loop mirror acts as a perfect reflector, working in a wide range of wavelengths, and for any input polarization state. The length of the fiber loop is not relevant in this case. Similarly, environmental effects on the fiber in the loop such as temperature changes have no effect as long as they cannot affect the polarization. If the power splitting ratio deviates from 50:50, one obtains less than 100% reflectance. This is shown in Figure 2. Again, the results are not dependent on the loop length. Figure 2: Reflectance of a linear fiber loop mirror as a function of the coupling ratio of the used fiber coupler. As the coupling ratio of a fiber coupler usually exhibits a substantial wavelength dependence, this transforms into an overall wavelength-dependent reflectance of the fiber loop mirror. A strong wavelength dependence can also be associated with birefringence. If a highly birefringent fiber (e.g. a polarization-maintaining fiber) is incorporated into the fiber loop, and the polarization evolution is properly adjusted with a fiber polarization controller, the spectral transmission function can exhibit pronounced oscillations. Their spectral period is inversely proportional to the birefringence (the index contrast between the polarization directions) and the length of that fiber. As the positions of the relatively sharply defined transmission dips react to temperature and strain, the configuration can be used as a fiber-optic sensor. An attraction is that whereas one measures changes of birefringence with interferometric accuracy, one is not particularly sensitive to environmental influences on the ordinary fiber connecting the birefringent fiber. One may also realize nearly temperature-independent strain sensors by using highly birefringent photonic crystal fibers, exhibiting a low temperature dependence of the birefringence, at least when the polymer coating is removed. 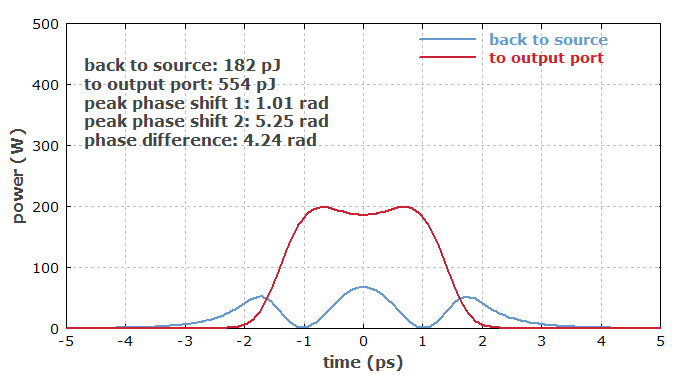 Particularly for ultrashort pulses in fibers, the Kerr nonlinearity can have substantial effects, as the peak power can be high. However, as long as the fiber loop remains symmetric and the coupling ratio is 50:50, the occurring nonlinear phase shifts do not influence the fiber loop's reflectance. This is because these phase shifts are the same for light propagating in both directions, so that these additional phase shifts cannot affect the interference conditions. Figure 3: A nonlinear amplifying loop mirror, containing an active fiber and a longer passive fiber. This changes for an asymmetric design. 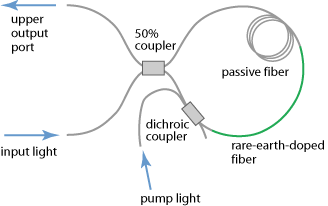 For example, a fiber loop may contain a rare-earth-doped fiber, which can amplify light when suitable pump light is injected, and a long passive fiber (see Figure 3). This configuration is called a nonlinear amplifying loop mirror (NALM). When light injected on the left side at a low power level, it will be mostly reflected back into the same port. In case of ultrashort pulses with a substantial peak power, however, we have substantial nonlinear phase changes in the loop. These are stronger for light propagating in counter-clockwise direction, since this is first amplified and then travels through the long passive fiber. Light in the opposite direction propagates with a lower power level for most of the length. As a result, the interference conditions are affected such that a power-dependent fraction of the input light reaches the upper output port. Such a power dependence would also result from strong optical attenuation on one side of a long passive fiber only, or simply from having an asymmetric coupling ratio. In that case, one has a nonlinear loop mirror (NOLM). The operation details are complicated by the fact that the nonlinear phase shift is not constant over the temporal pulse profile, but rather strongest for the peak and weaker in the wings. Furthermore, chromatic dispersion can have substantial effects. Therefore, the overall behavior can be understood well only by using a numerical simulation model. Figure 4 shows the outputs in an example case, where the loop contains a 1 m long ytterbium-doped fiber and a 10 m long passive fiber. For soliton-shaped input pulses with 0.1 nJ energy and 2 ps duration, a substantial part of the output power goes into the upper output port. The amplifier is pumped with 100 mW at 975 nm, and the steady state for a pulse train with 10 MHz repetition rate has been calculated. Both fibers exhibit normal dispersion; in the anomalous dispersion regime, where soliton effects can occur, the characteristics of the nonlinear loop mirror are significantly different. Figure 4: Output powers of the two ports of an amplifying fiber loop mirror in the time domain. The numerical simulation has been done with the software RP Fiber Power. For the pulse peak, the difference in nonlinear phase shifts between the two propagation directions in the loop is larger than π, which would be the ideal value for coupling to the upper output port. However, this improves the coupling in the wings. Overall, this situation is close to the case with optimum coupling. Generally, substantial pulse distortions must be expected, even though their type and magnitude can strongly depend on details like chromatic dispersion and operation power levels. 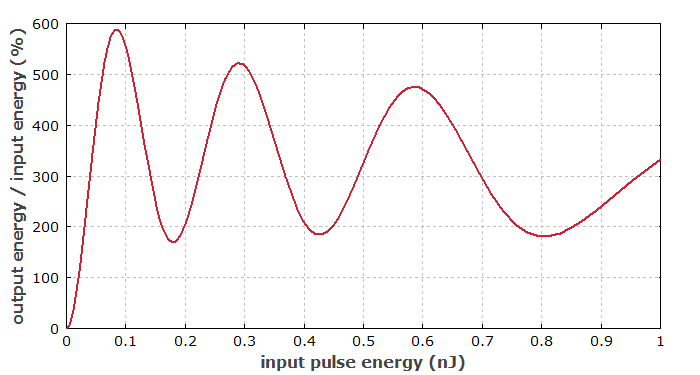 Figure 5 shows how the ratio of output energy in the upper port to input energy in the lower port varies with the input pulse energy. This dependence is influenced by various effects: increasing gain saturation in the amplifying fiber and increasing pulse distortions through chromatic dispersion and fiber nonlinearity for increasing pulse energies. 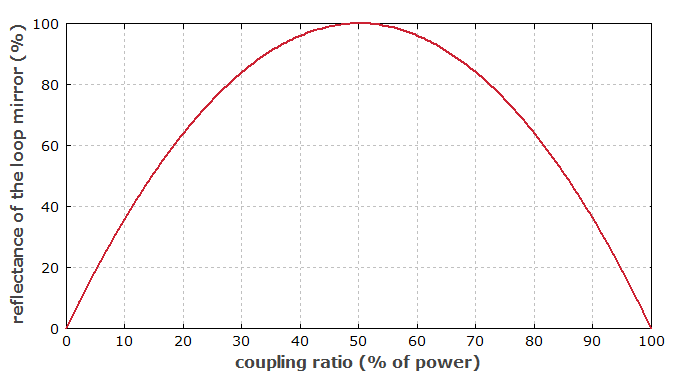 Figure 5: Fraction of output power in the upper output port as a function of the input pulse energy. In a mode-locked fiber laser, such a device can act as an artificial saturable absorber which starts and stabilizes the mode locking, i.e., the pulse formation . A well-known embodiment of this approach is the figure-of-eight fiber laser, where the nonlinear fiber loop mirror forms one part of the “eight” and the actual laser resonator the other one. The article on mode-locked fiber lasers contains more details on this. In optical fiber communications, nonlinear loop mirrors can be used as nonlinear filters. For example, a well designed filter may well transmit soliton pulses (without substantial distortions) while largely suppressing any low-intensity background radiation; it can then be called a soliton filter. The same can also be useful in other application areas where optical signal processing is required.